Tripp Lite P569 Series HDMI cables are the latest generation of Digital Video and Audio: HDMI High Speed with Ethernet. These cables offer the highest level of performance by HDMI: supports Ethernet Data Connectivity, Audio Return Channel, 3D support, and video resolutions up to 4096 x 2160. High Speed (or "category 2") HDMI cables have been tested to perform at speeds of 340Mhz or up to 18 Gbps, which is the highest bandwidth currently available over an HDMI cable and, can successfully handle 1080p signals including those at increased color depths and/or increased refresh rates from the source. These cables are backward compatible with previous versions of HDMI, and will work in all HDMI cabling scenarios. 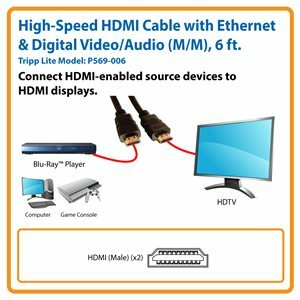 High-Speed HDMI Cable with Ethernet and Digital Video with Audio (M/M), 6 ft.
Tripp Lite’s P569-006 connects your HDMI video source, such as a computer or Blu-ray™ player, to an HDMI-enabled monitor, projector or television. This latest generation HDMI cable supports Ethernet data connectivity, audio return channel, 3D and Ultra High Definition (UHD) video resolutions up to 4096 x 2160 (4K x 2K). In addition to supporting 4K x 2K UHD video resolutions, the P569-006 performs at speeds up to 18.0 Gbps, currently the largest bandwidth available over HDMI. It can successfully transmit 1080p signals, including those at increased color depths and refresh rates. It’s also backward compatible with previous HDMI generations and works with the iPad 2® for video mirroring. Molded gold-plated connectors ensure excellent conductivity. Integral strain relief ensures the cable and connectors last a long time. A flexible PVC jacket makes the P569-006 easy to install in tight spaces. The P569-006 comes with a lifetime warranty. It’s manufactured in compliance with strict RoHS specifications, reflecting Tripp Lite’s commitment to environmental responsibility.